Note: This post does not cover recommendations on how to best use treats as rewards, nor is it meant to imply every horse could benefit from treat rewards. Treats are not always the best option, but there are lots of different ways they can be incorporated into your horses life - using them when training might not be the best option for your horse. Horses are designed to graze constantly throughout the day. Their stomachs produce acid at a steady rate, even if there is no food to be consumed. For comparison, humans do not produce stomach acid until stimulated. This means the horse's body is going to signal the horse to eat at frequent intervals, to match the rate of stomach acid. If they do not eat often enough, the amount of stomach acid can cause sores to burn through the stomach lining; these sores are known as ulcers. Most horses today do not live on 24/7 grass pasture. Most horses receive 2 meals a day, and consume those meals quickly. The rest of the day, they are hungry. Enter the human with the pouch of food.... can you blame them for being pushy? I believe providing treats is a great way to motivate a horse that needs something extra during training. Not only does the treat make the work more enjoyable, but it provides that small amount of grazing throughout your training session that their body needs. 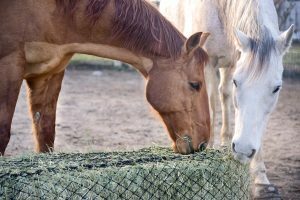 Your horse will be able to remain focused on you for longer, as they won't experience the hunger that they would have after 20-30 minutes without eating. Taking breaks to allow them to munch on some grass or hay is also a good idea during rides or ground sessions! I always carry hay cubes on longer trail rides now, so that I can feed them throughout the ride and keep my horses happy and comfortable. 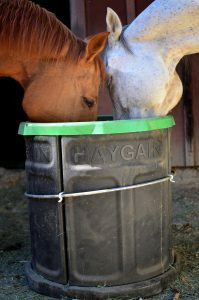 If your horse has constant access to forage, introducing treats can easily be very positive and safe. I've noticed my horses are calmer and most patient after eating, even when I am offering treat rewards that they love. I prefer my horse to be working with me because they like what we're doing, versus because they are hungry and I am the only source of food. I'm not understating the importance of good training. You can still teach your horse to be aggressive with treats even if they do not suffer from hunger. Sometimes my horses exhibit dominant behavior with each other when I work with them at the same time, but they do so in a competition of my attention instead of over food, so the behavior is much easier to correct than if they were fighting over food. I know this because in the past, I've worked with them together when I didn't know better and they were competing for food - and that behavior was too dangerous for treat rewards. There are two main reasons I would say NOT to use treats. The first is your horse is very hungry. The second is your horse is already trained to react poorly to food rewards. The Hungry Horse: Let's say you arrive at the barn in the afternoon, after school or work. Your horse was probably fed breakfast in the morning, and will be receiving dinner soon. But they haven't eaten in maybe 6+ hours. Your horse is feeling starved! If you try to work with your horse using treat rewards, you will be setting yourself up for training a "greedy", pushy horse. 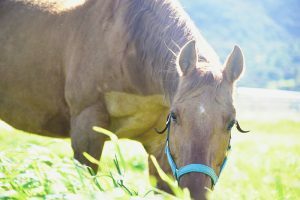 The Unintentionally-Trained Horse: If your horse is receiving only a couple meals a day and goes without food the rest of the day, your horse probably greets feeding time with less than ideal behaviors. They might kick at the wall, show dominant behaviors towards other horses or people, and otherwise react impatiently. After displaying all these poor behaviors, your horse is fed - also known as rewarded, with food. I do think horses can learn to dissociate this behavior from what they do during your training sessions, but you'll be starting off at a disadvantage so you need to be confident in your abilities to untrain dangerous behavior. If you are trying to use food rewards with a horse that already behaves this way, AND is also hungry, you are setting your horse up to become aggressive. Proper manners around treats do need to be taught - but I don't think it is fair to even attempt this if the horse is just trying to satiate their hunger because you are withholding the only food they've seen for hours. A few hours without food for them probably feels like a whole day without food for you! I don't think I would respect someone making me dance for delicious cookies after feeling starved all day, would you? PS - treats featured in the photo are from Giddyap.com! I received these, along with my Haygain Forager, in exchange for my honest review.